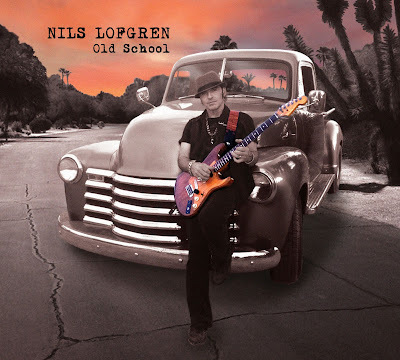 At the tender age of 17, Nils Lofgren was asked to join Neil Young’s band, playing on some of his most classic material of the early ‘70s. Lofgren went on to pursue a favorable solo career, with tours that would earn him a reputation for stage theatrics including playing guitar while doing flips on a trampoline. In 1984 he was asked to join Bruce Springsteen’s E Street Band... and the rest is history. With guest appearances by Lou Gramm (Foreigner), Paul Rodgers (Free, Bad Company, Queen), and legendary soul singer, Sam Moore (Sam & Dave), Old School marks his first album of new material in five years. 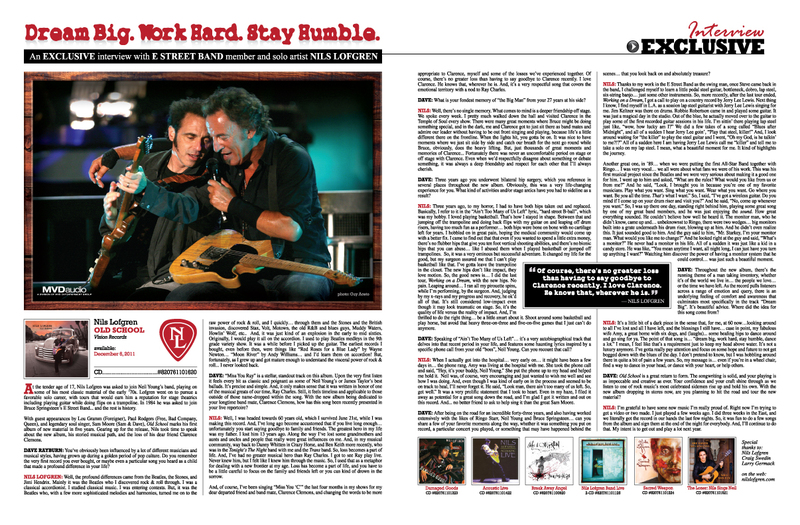 Gearing up for the release, Nils took time to speak about the new album, his storied musical path, and the loss of his dear friend Clarence Clemons. DAVE RAYBURN: You’ve obviously been influenced by a lot of different musicians and musical styles, having grown up during a golden period of pop culture. Do you remember the very first record you ever bought, or maybe even a particular song you heard as a child that made a profound difference in your life? NILS LOFGREN: Well, the profound differences came from the Beatles, the Stones, and Jimi Hendrix. Mainly it was the Beatles who I discovered rock & roll through. I was a classical accordionist. I studied classical music. I was entering contests. But, it was the Beatles who, with a few more sophisticated melodies and harmonies, turned me on to the raw power of rock & roll, and I quickly… through them and the Stones and the British invasion, discovered Stax, Volt, Motown, the old R&B and blues guys, Muddy Waters, Howlin’ Wolf, etc.. And, it was just kind of an explosion in the early to mid sixties. Originally, I would play it all on the accordion. I used to play Beatles medleys in the 9th grade variety show. It was a while before I picked up the guitar. The earliest records I bought, even before then, were things like “Red Roses for a Blue Lady” by Wayne Newton… “Moon River” by Andy Williams… and I’d learn them on accordion! But, fortunately, as I grew up and got mature enough to understand the visceral power of rock & roll... I never looked back. DAVE: “Miss You Ray” is a stellar, standout track on this album. Upon the very first listen it feels every bit as classic and poignant as some of Neil Young’s or James Taylor’s best ballads. It’s precise and simple. And, it only makes sense that it was written in honor of one of the musical greats of our time, Ray Charles. Still, it feels timeless and applicable to those outside of those name-dropped within the song. With the new album being dedicated to your longtime band mate, Clarence Clemons, how has this song been recently presented in your live repertoire? NILS: Well, I was headed towards 60 years old, which I survived June 21st, while I was making this record. And, I’ve long ago become accustomed that if you live long enough… unfortunately you start saying goodbye to family and friends. The greatest hero in my life was my father. I lost him 13 years ago. Along the way I‘ve lost some grandmothers and aunts and uncles and people that really were great influences on me. And, in my musical community, way back to Danny Whitten in Crazy Horse, and Ben Keith more recently, who was in the Tonight’s The Night band with me and the Trans band. So, loss becomes a part of life. And, I’ve had no greater musical hero than Ray Charles. I got to see Ray play live. Never knew him, but I felt like I knew him through the music. So, I used that as a metaphor for dealing with a new frontier at my age. Loss has become a part of life, and you have to be a little careful to focus on the family and friends left or you can kind of drown in the sorrow. And, of course, I’ve been singing “Miss You ‘C’” the last four months in my shows for my dear departed friend and band mate, Clarence Clemons, and changing the words to be more appropriate to Clarence, myself and some of the losses we’ve experienced together. Of course, there’s no greater loss than having to say goodbye to Clarence recently. I love Clarence. He knows that, wherever he is. And, it’s a very respectful song that covers the emotional territory with a nod to Ray Charles. DAVE: What is your fondest memory of “the Big Man” from your 27 years at his side? NILS: Well, there’s no single memory. What comes to mind is a deeper friendship off stage. We spoke every week. I pretty much walked down the hall and visited Clarence in the Temple of Soul every show. There were many great moments where Bruce might be doing something special, and in the dark, me and Clarence got to just sit there as band mates and admire our leader without having to be out front singing and playing, because life’s a little different there on the frontline. When the lights hit, you gotta be on. It was nice to have moments where we just sit side by side and catch our breath for the next go round while Bruce, obviously, does the heavy lifting. But, just thousands of great moments and memories of Clarence... Fortunately there was never an uncomfortable period on stage or off stage with Clarence. Even when we’d respectfully disagree about something or debate something, it was always a deep friendship and respect for each other that I’ll always cherish. DAVE: Three years ago you underwent bilateral hip surgery, which you reference in several places throughout the new album. Obviously, this was a very life-changing experience for you. What kind of activities and/or stage antics have you had to sideline as a result? NILS: Three years ago, to my horror, I had to have both hips taken out and replaced. Basically, I refer to it in the “Ain‘t Too Many of Us Left” lyric, “hard street B-ball”, which was my hobby. I loved playing basketball. That’s how I stayed in shape. Between that and jumping off the trampoline and doing back flips with my guitar on and leaping off drum risers, having too much fun as a performer… both hips were bone on bone with no cartilage left for years. I hobbled on in great pain, hoping the medical community would come up with a better fix. I came to find out that that even if you wanted to spend a little extra money, there’s no flubber hips that give you ten foot vertical shooting abilities, and there’s no bionic hips that you can abuse… like I abused them when I played basketball or jumped off trampolines. So, it was a very ominous but successful adventure. It changed my life for the good, but my surgeon assured me that I can’t play basketball like that. I’ve gotta leave the trampoline in the closet. The new hips don’t like impact, they love motion. So, the good news is… I did the last tour, Working on a Dream, with the new hips. No pain. Leaping around… I ran all my pirouette spins, while I’m performing, by the surgeon. And, judging by my x-rays and my progress and recovery, he ok’d all of that. It’s still considered low-impact even though it may look traumatic on stage. So, it’s the quality of life versus the reality of impact. And, I’m thrilled to do the right thing… be a little smart about it. Shoot around some basketball and play horse, but avoid that heavy three-on-three and five-on-five games that I just can’t do anymore. DAVE: Speaking of “Ain’t Too Many of Us Left”… it’s a very autobiographical track that delves into that recent period in your life, and features some haunting lyrics inspired by a specific phone call from your old “boss”, Neil Young. Can you recount that call? NILS: When I actually got into the hospital… very early on… it might have been a few days in… the phone rang. Amy was living at the hospital with me. She took the phone call and said, “Hey, it’s your buddy, Neil Young.” She put the phone up to my head and helped me hold it. Neil was, of course, very encouraging and just wanted to wish me well and see how I was doing. And, even though I was kind of early on in the process and seemed to be on track to heal, I’ll never forget it. He said, “Look man, there ain’t too many of us left. So, get well.” It was a very prolific statement that I took to heart. Even in my haze, I filed it away as potential for a great song down the road, and I’m glad I got it written and out on this record. And... no better friend to ask to help sing it than the great Sam Moore. DAVE: After being on the road for an incredible forty-three years, and also having worked extensively with the likes of Ringo Starr, Neil Young and Bruce Springsteen… can you share a few of your favorite moments along the way, whether it was something you put on record, a particular concert you played, or something that may have happened behind the scenes… that you look back on and absolutely treasure? NILS: Thanks to my work in the E Street Band as the swing man, once Steve came back in the band, I challenged myself to learn a little pedal steel guitar, bottleneck, dobro, lap steel, six-string banjo… just some other instruments. So, more recently, after the last tour ended, Working on a Dream, I got a call to play on a country record by Jerry Lee Lewis. Next thing I know, I find myself in L.A. as a session lap steel guitarist with Jerry Lee Lewis singing for me. Jim Keltner was there on drums. Robbie Robertson came in and played some guitar. It was just a magical day in the studio with Jerry Lee Lewis. Out of the blue, he actually moved over to the guitar to play some of the first recorded guitar sessions in his life. I’m sittin’ there playing lap steel just like, “wow, how lucky am I?” We did a few takes of a song called “Blues after Midnight”, and all of a sudden I hear Jerry Lee goin’, “Play that steel, killer!” And, I look around waiting for “the killer” to play the steel guitar and I went, “Oh my God, is he talkin’ to me?! ?” All of a sudden here I am having Jerry Lee Lewis call me “killer” and tell me to take a solo on my lap steel. I mean, what a beautiful moment for me. It kind of highlights the journey. Another great one, in ’89… when we were putting the first All-Star Band together with Ringo… I was very vocal… we all were about what fans we were of his work. This was his first musical project since the Beatles and we were very serious about making it a good one for him. I went up to him and asked, “What are the rules? What would you like from us or from me?” And he said, “Look, I brought you in because you’re one of my favorite musicians. Play what you want. Sing what you want. Wear what you want. Go where you want. Be you all the time. That’s what I want.” So, I said, “I’ve got a wireless guitar. Do you mind if I come up on your drum riser and visit you?” And he said, “No, come up whenever you want.” So, I was up there one day, standing right behind him, playing some great song by one of my great band members, and he was just enjoying the sound. How great everything sounded. He couldn’t believe how well he heard it. The monitor man, who he didn’t know, came up and… unbeknownst to Ringo, there were two wedges… big monitors built into a grate underneath his drum riser, blowing up at him. And he didn’t even realize this. It just sounded good to him. And the guy said to him, “Mr. Starkey, I’m your monitor man. What would you like me to change?” And he looked right at the guy and said, “What’s a monitor?” He never had a monitor in his life. All of a sudden it was just like a kid in a candy store. He was like, “You mean anytime I want, all night long, I can just have you turn up anything I want?” Watching him discover the power of having a monitor system that he could control… was just such a beautiful moment. DAVE: Throughout the new album, there’s the running theme of a man taking inventory, whether it’s of the world we live in… the people we love… or the time we have left. As the record pulls listeners across a range of emotion and query, there is an underlying feeling of comfort and awareness that culminates most specifically in the track “Dream Big”. It’s beautiful advice. Where did the idea for this song come from? NILS: It’s a little bit of a dark piece in the sense that, for me, at 60 now…looking around to all I’ve lost and all I have left, and the blessings I still have… case in point, my fabulous wife Amy, a great home with six dogs, and (laughs)... some healing hips to dance around and go sing for ya. The point of that song is… “dream big, work hard, stay humble, dance a lot.” I mean, I feel like that’s a requirement just to keep my head above water. It’s not a luxury anymore. I’ve gotta really pay attention and focus on some hope and future to not get bogged down with the blues of the day. I don’t pretend to know, but I was hobbling around there in quite a bit of pain a few years. So, my message is… even if you’re in a wheel chair, find a way to dance in your head, or dance with your heart, or help others. DAVE: Old School is a great return to form. The songwriting is solid, and your playing is as impeccable and creative as ever. Your confidence and your craft shine through as we listen to one of rock music’s most celebrated sidemen rise up and hold his own. With the new album dropping in stores now, are you planning to hit the road and tour the new material? NILS: I’m grateful to have some new music I’m really proud of. Right now I’m trying to get a video or two made. I just played a few weeks ago. I did three weeks in the East, and we literally got the record in our hands the last few nights. So, it was fun to do a few songs from the album and sign them at the end of the night for everybody. And, I’ll continue to do that. My intent is to get out and play a lot next year.